There’s often talk on Instagram & other sites about how people don’t present “real” life/work there – it’s all cleaned-up, perfect & presentable. I certainly do that on the blog and IG. I try to compose most of my photos so they show what I wanted to present. Here’s a photo shot with no thought, planning, etc – the camera was set up to shoot every two minutes, whatever was happening at the bench then. It looks like I work in near-total darkness, which is just the opposite of how it is. If I had to get a shot of this process, I’d either wait til the sun was off those windows, or I’d cover them, to brighten the bench. I’d also bracket shots on the camera, etc. Well, what could be more real-life than a complete (or nearly-so) cleaning of the shop? I photographed some of it, just in case something good happened. I didn’t shoot the complete “before” picture. Here, I’d already started sorting, so making a mess to clean up a mess. 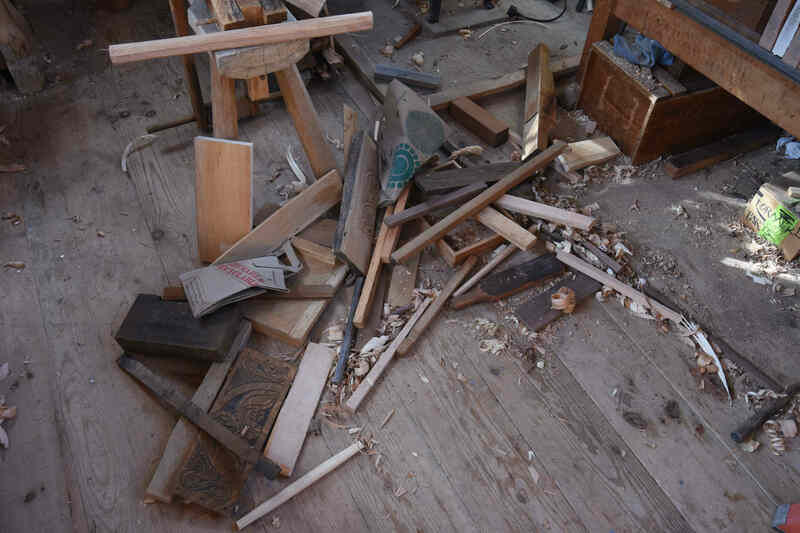 It either ends up on the benches or the floor for sorting. I emptied the shelf under my main bench, and sorted these three boxes. Mostly it was dumping shavings out of them. These are tools I use nearly everyday (on the right) some of the time (middle) and rarely (left – I hate the tools in this box, mostly. Except the Millers Falls drill). 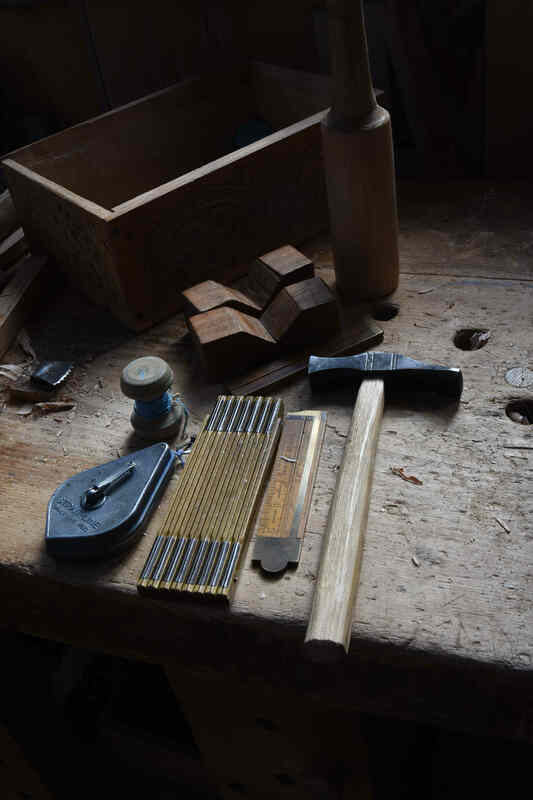 The everyday box up on the bench – (see, no planning for this photo) – hammer, carving mallet, chalklines, rulers, joiners’ saddles. I use these tools a lot. 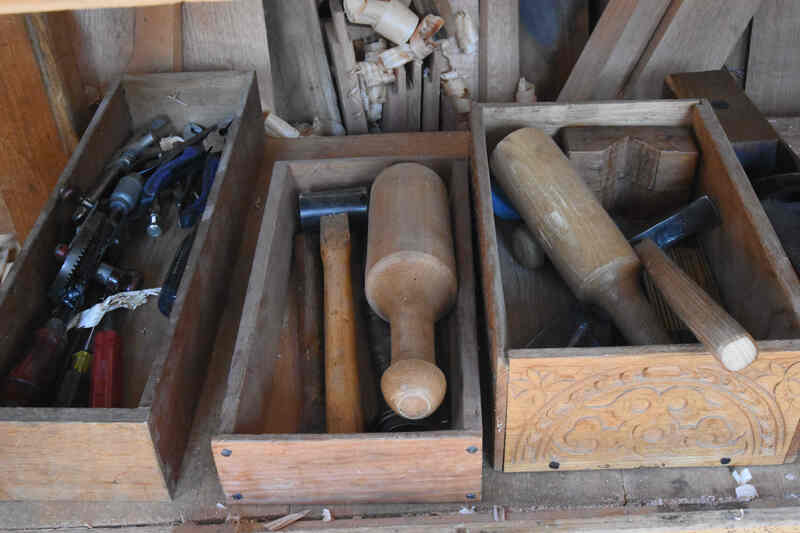 I’ve been planing some oak for joinery lately and the chalklines & saddles are key in that work. 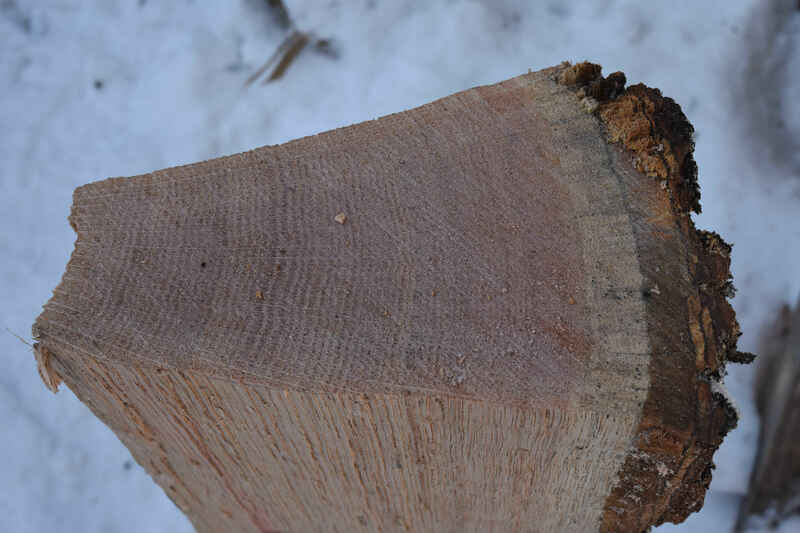 I have some very straight, slow-growing red oak. Great stuff to plane. 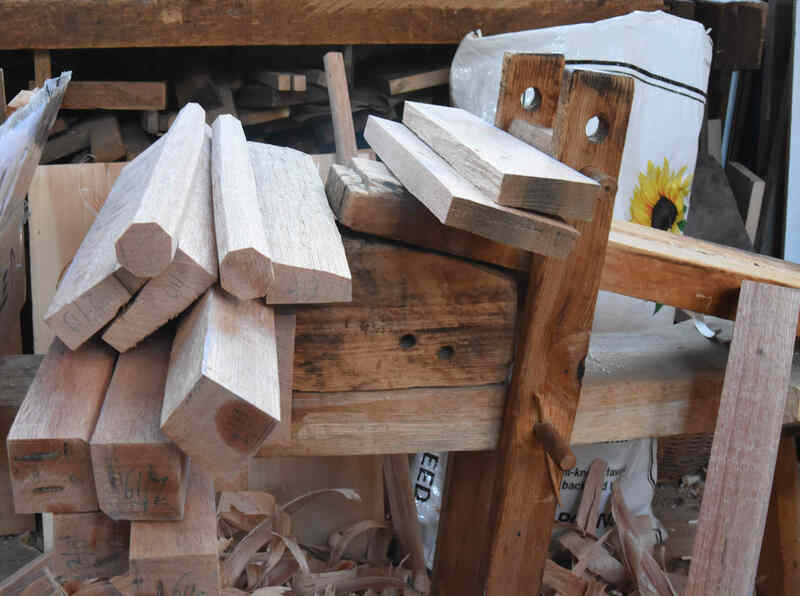 I started planing up joined stool parts, and stuff for a wainscot chair. Under that bench when I was done – it won’t stay this tidy for long. 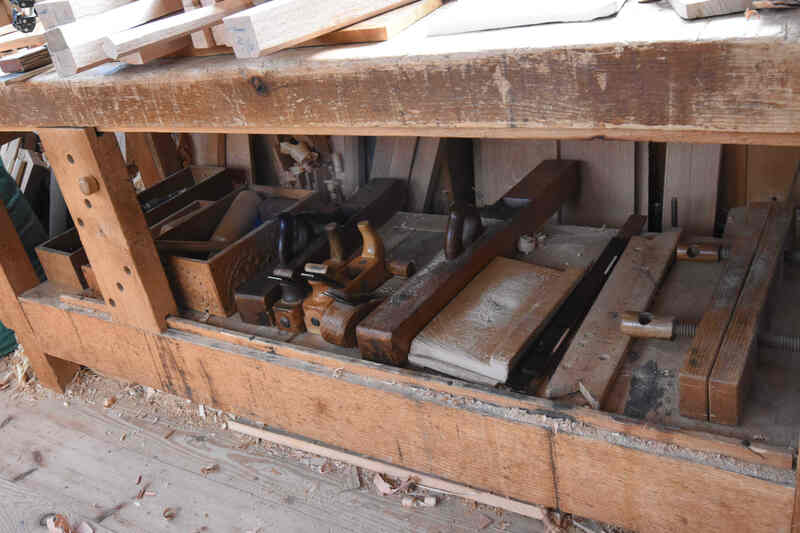 All that belongs under there are those loose tools in boxes, then planes, bench hook, winding sticks, etc. This stuff was under the other bench. Most of this got burned. A few bits & pieces went back under the bench. There’s an old plane I made that is all done. I salvaged the handmade iron and will make a new plane for it. But the cracked & broken body of that one will go in the stove. This one is by Wille Sundqvist, it belonged to Jennie Alexander. 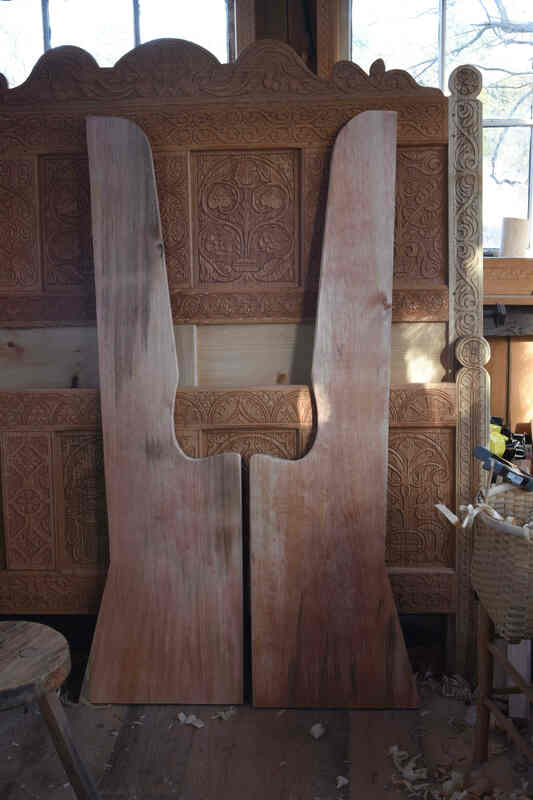 As I moved around the shop, sorting things here & there, I shifted these two boards for the settle I’m making next. It made a sort of white pine Rorschach test. I had to clean up the shop to shoot photos for assembling the bedstead. that’s next. 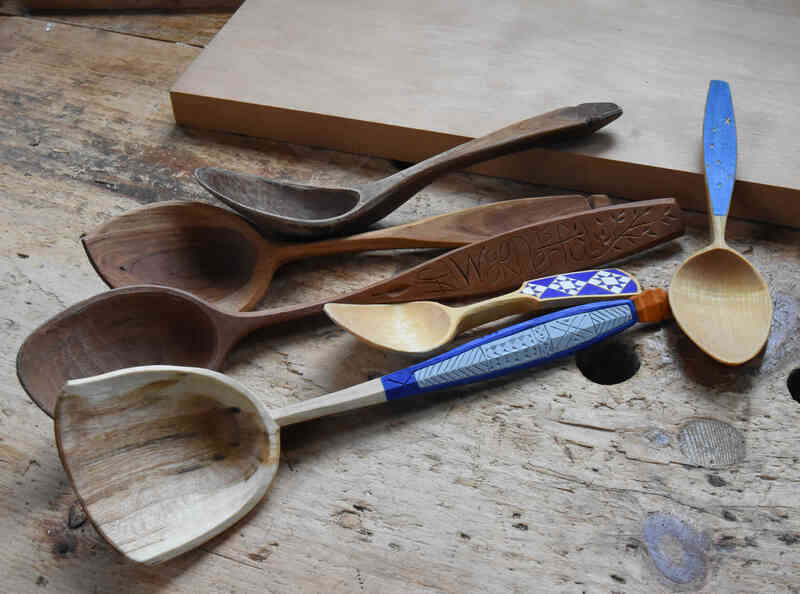 There’s still some tickets available for Plymouth CRAFT’s first-ever one-day Spoon event. 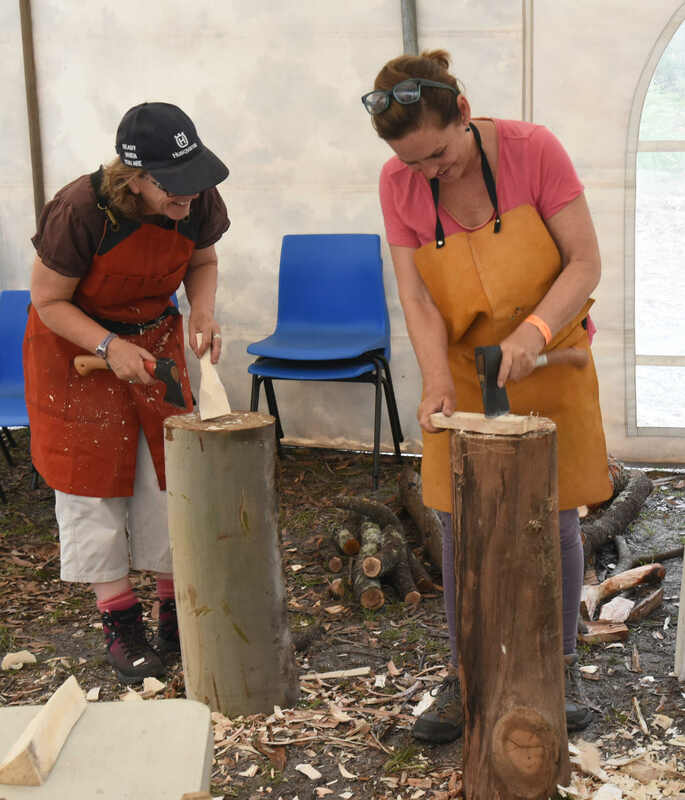 https://www.plymouthcraft.org/spoon-day Our plan is to have a big woodpile, a host of participants, and then we’ll add a bunch of our spoon carving friends to help everyone learn/have fun/explore. 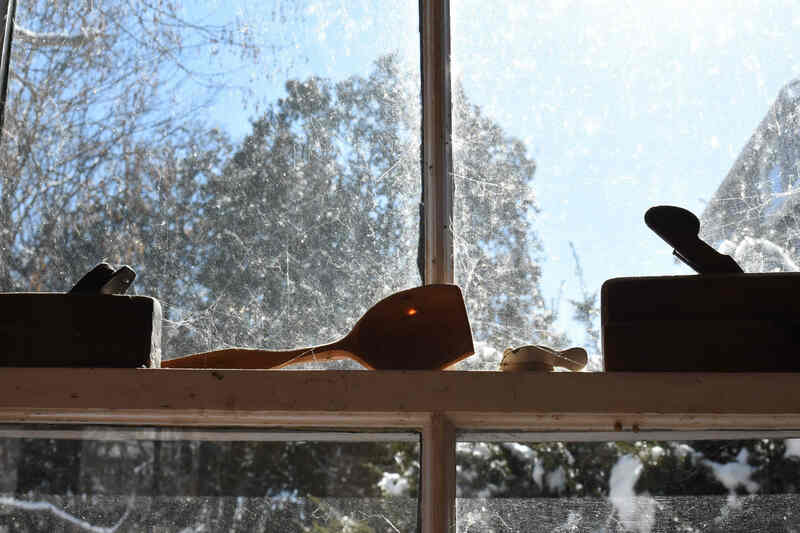 Usually all the Dave Fisher https://davidffisherblog.wordpress.com/ hype is about his bowls, but on this day his attention will be on helping you carve spoons, his are the top three in the photo above; below is the spoon Dave gave me the day we met; 2009. 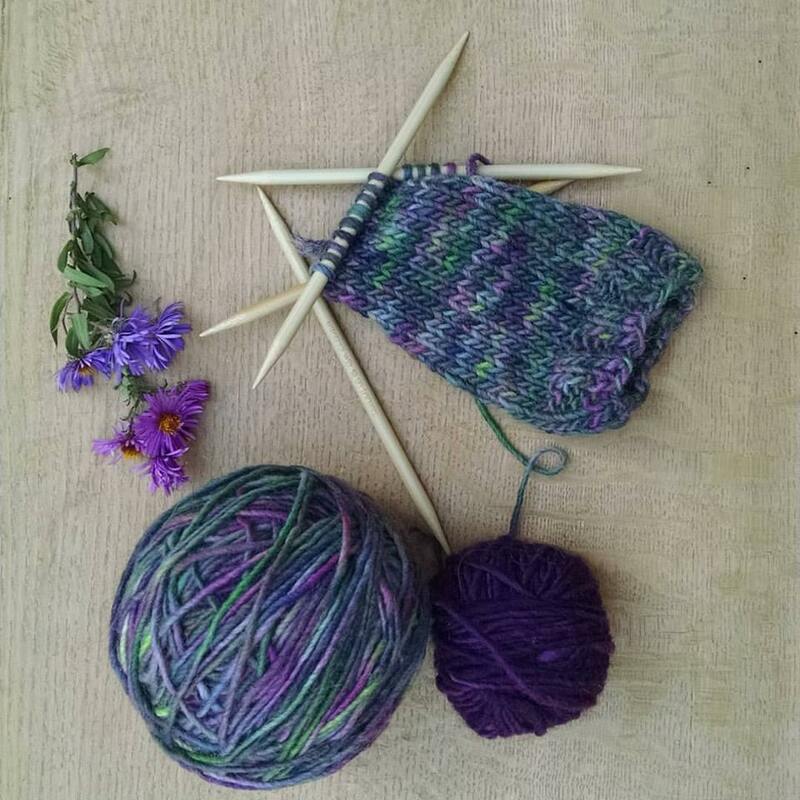 Below his is a classic quilt-pattern spoon by globe-trotting Amy Umbel, https://www.instagram.com/amy_umbel/?hl=en We’re happy to have roped her into Massachusetts for this event. Of course, the spoon on the right is by JoJo Wood. I don’t need to say anything I haven’t already said, do I? Tickets go on sale February 2nd. In case you didn’t hear that – TICKETS GO ON SALE FEBRUARY 2ND. 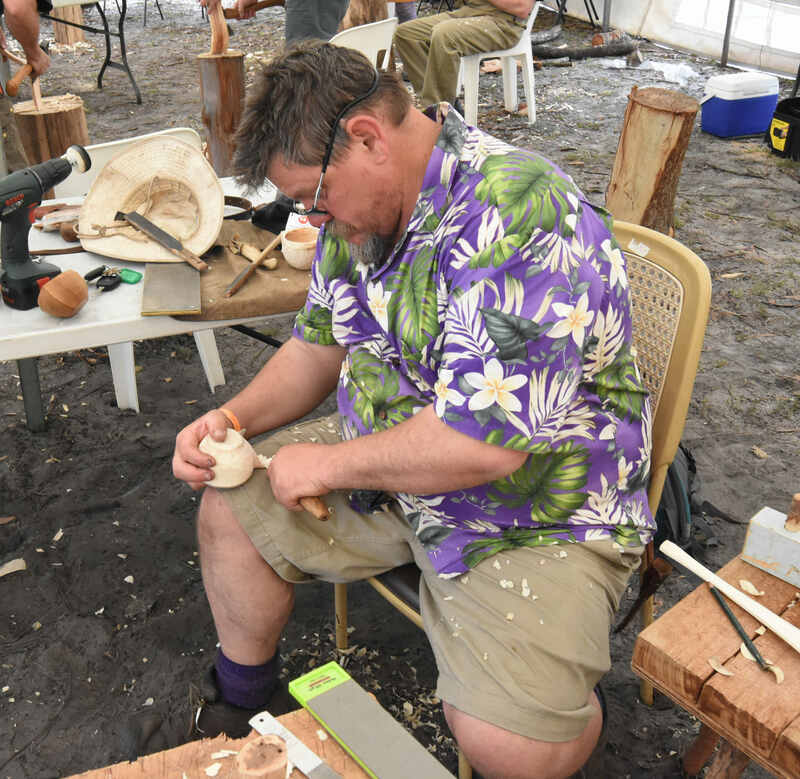 We just finished a 3-day series of spoon carving sessions through Plymouth CRAFT this weekend. https://www.plymouthcraft.org/ I didn’t shoot many photos; so I’ll swipe some from Marie Pelletier. Overbrook is a venue we use a lot, and there’s a wood stove in the dance hall there where we hold some of our classes. Usually, it’s adequate to keep the room comfortable enough to work in. This time – it was tough. But our carvers were tougher…if you count the layers inside my sleeve there – and add the vest, you get an idea of how cold it was on day 3. 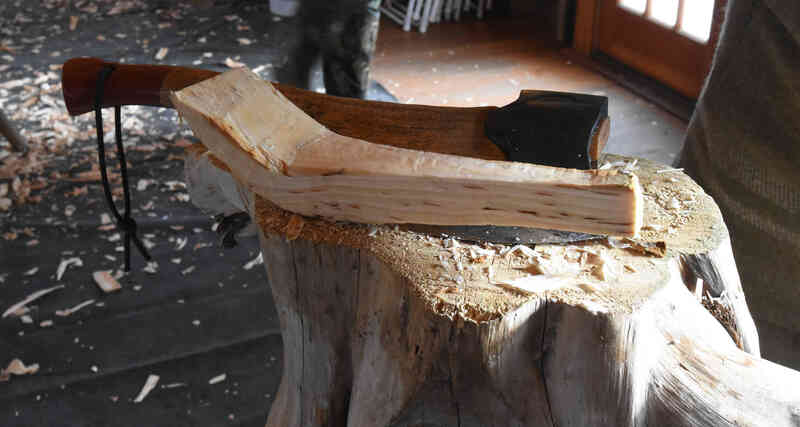 The first 2 days were our “usual” class, geared towards beginning spoon carvers. I had some able assistance from Jay Ketner. Kate here is not as maimed as she looks, she just had a small cut that was in a hard-to-wrap spot. 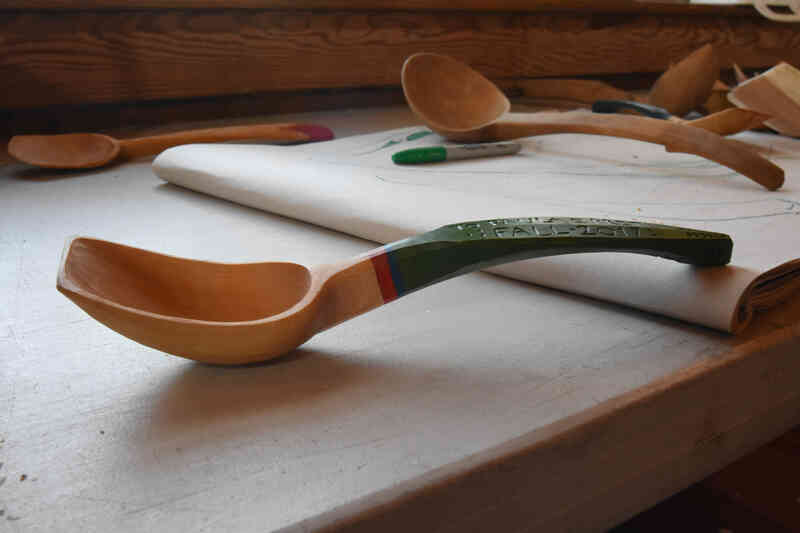 Then the 3rd day was “advanced” – meaning it was a class for people to fine-tune some of their skills, or spoon design. 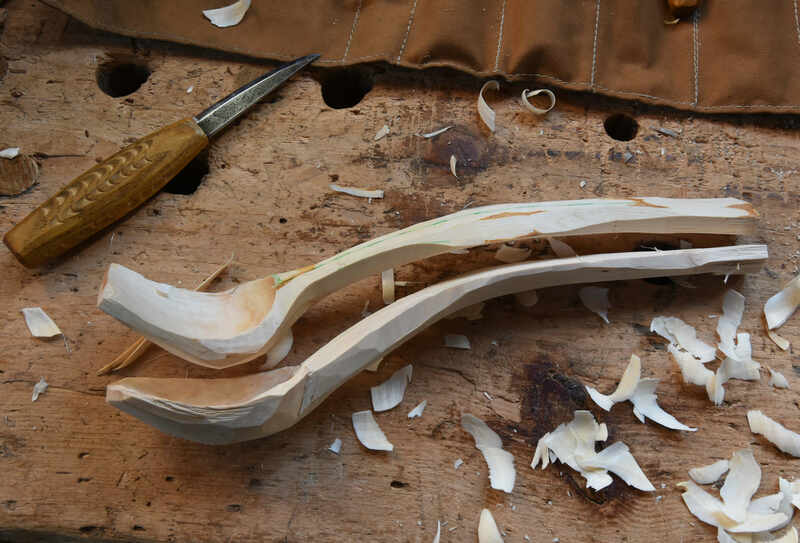 What it really boils down to is carving spoons from crooks. We had a pile of crooks, mostly large, mostly cherry. Here’s a normal-sized example. 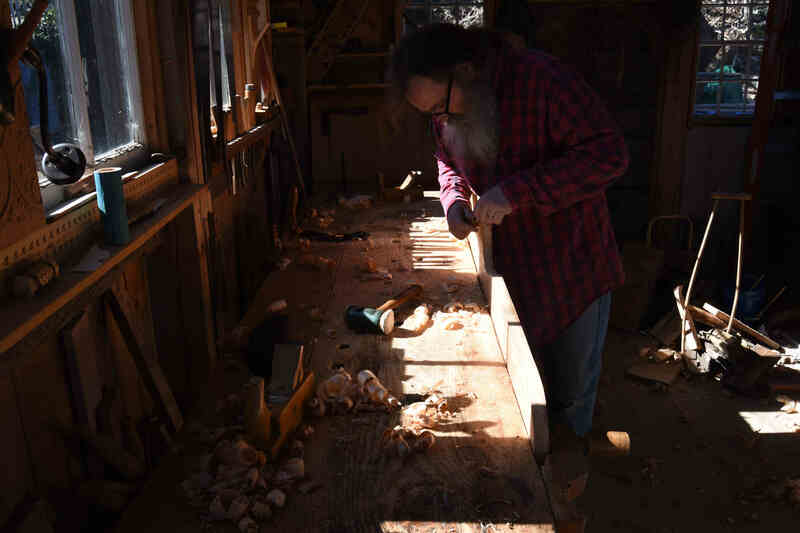 I continue to be amazed at the spoon-carving explosion; and grateful to all the students who keep coming back to us at Plymouth CRAFT. Thanks everyone. 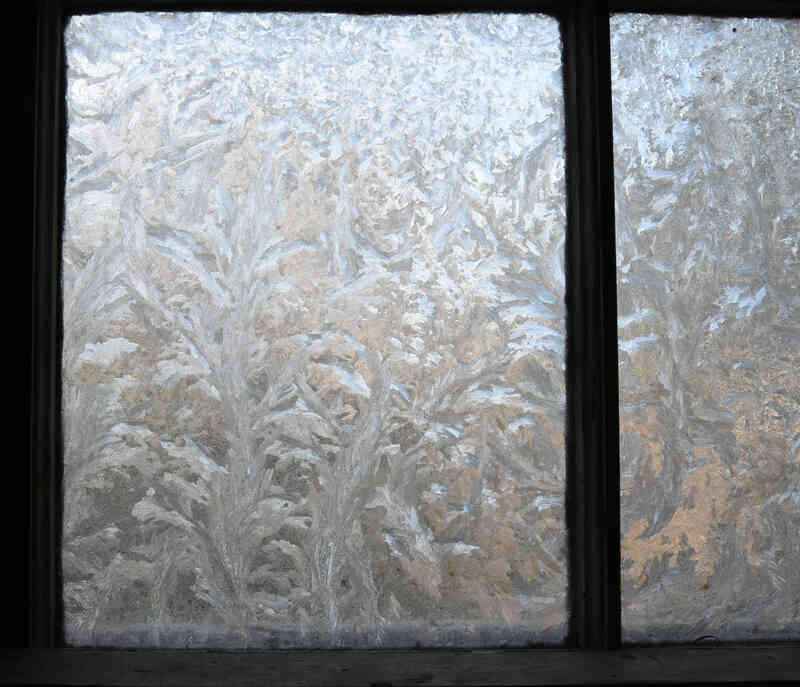 Closing with frost on the window, not the pumpkin. 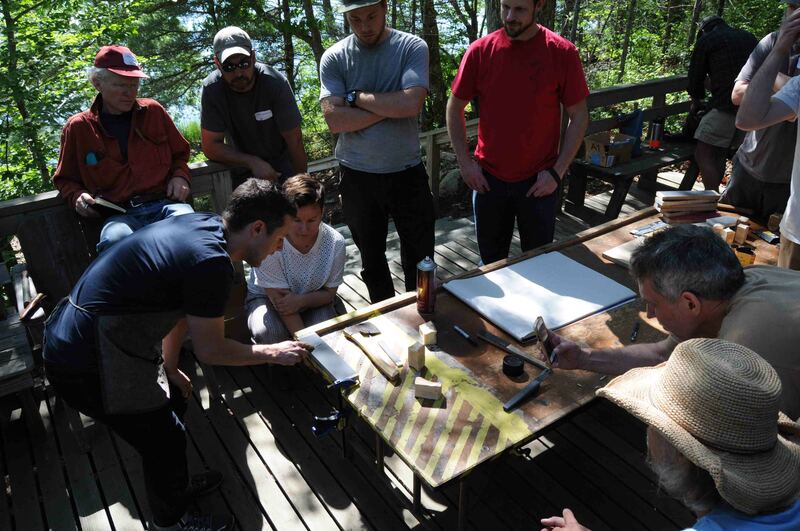 Yesterday’s announcement of the ladderback chair class was a hit. Filled up quickly. We’re toying with the idea of adding a 2nd session some time in 2019. We’ll need to look at schedules to see if Paula, Pret & I have spaces in ours that align with some in the venue. I think Paula will make a waiting list in the mean time. Right now, I don’t have a lot of classes scheduled for 2019; there’s a couple to be announced in January. And I’ll add some here and there as holes get filled in various schedules. 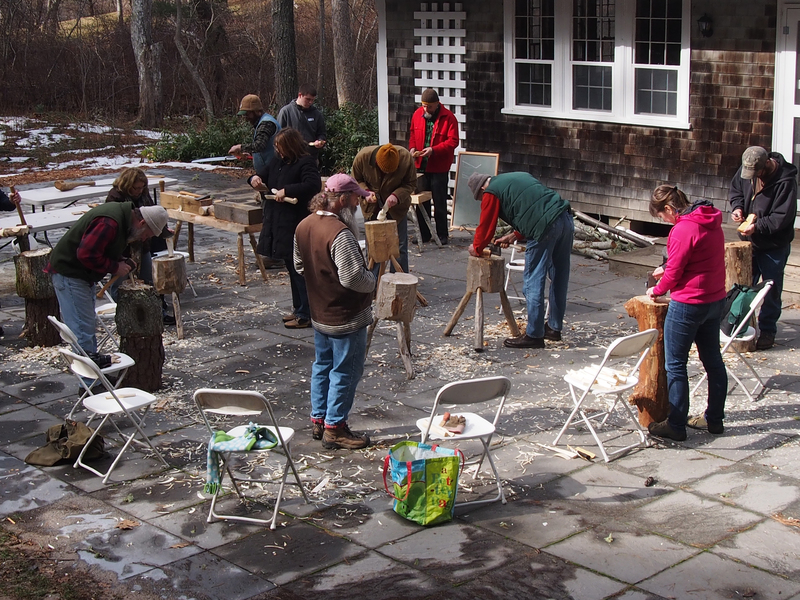 But yesterday I completely forgot to mention we’ve got a spoon carving class coming right up in January. Saturday & Sunday January 19 & 20, with an optional third day on Monday January 21. 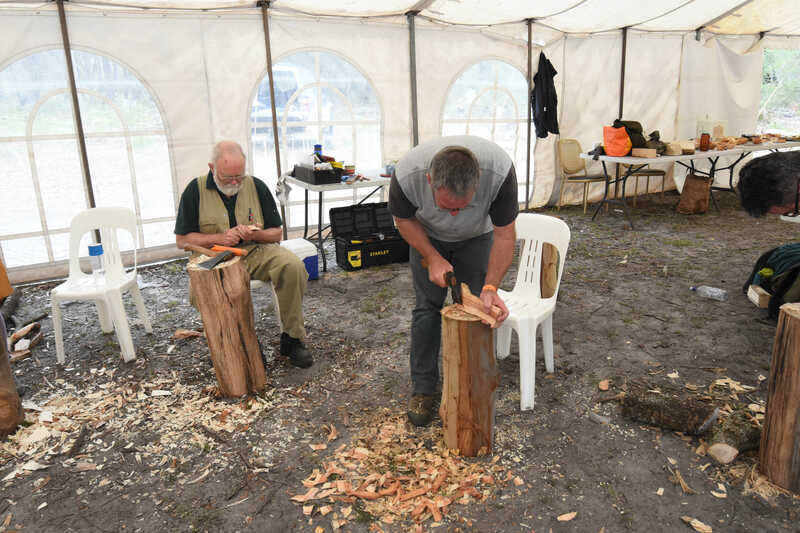 That third day is available as a stand-alone; we’re calling it “advanced” but in this case all that means is you’ve gone through the bits about learning knife grips, hatchet work, etc and for this one-day session we’ll be able to concentrate further on spoon shape and design. Most of the work that day will feature natural crooks. And lots of spoons for inspiration. 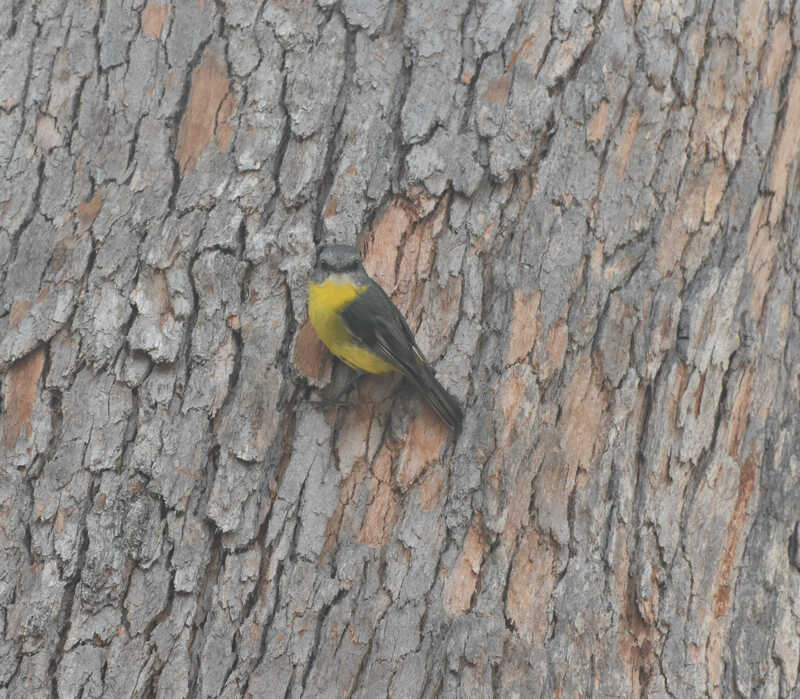 Most of my Australian photos were of birds…so this post will be a bit light in pictures. Once I was teaching, I had little time for photos. 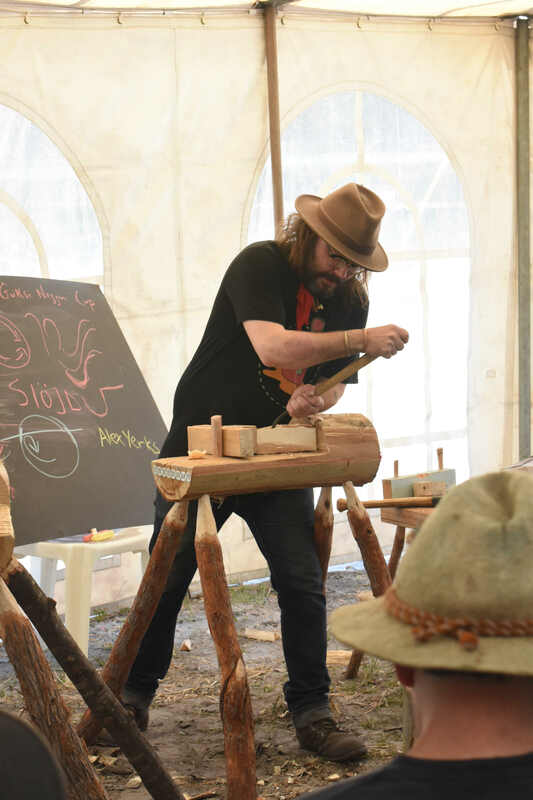 The event started off with two 2-day classes, me with spoons carved from (intractable) crooks; and the Wayfaring Stranger Alex Yerks https://www.instagram.com/alex_yerks/?hl=en carving kuksas. If you’re new to Alex’s scene; he’s a wanderer. New York, Minnesota, London – now Australia and New Zealand. 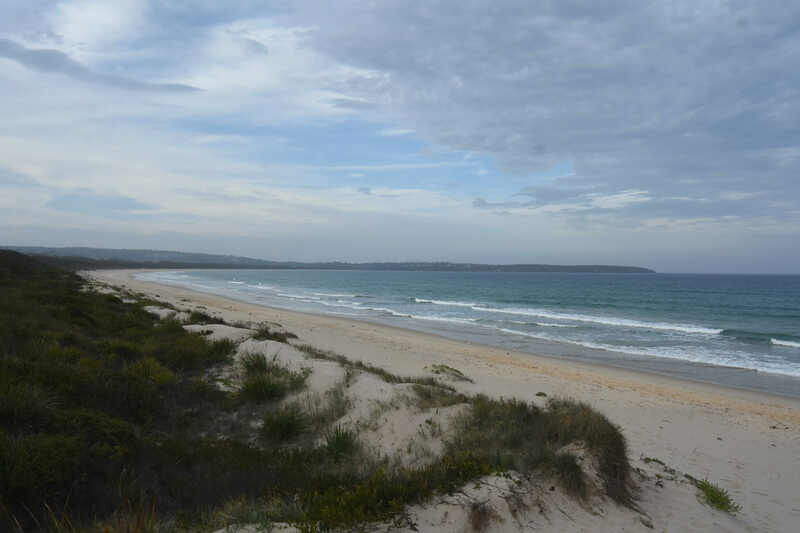 The site was about a 5-10 minute walk from an astoundingly beautiful Pacific beach called Merimbula Bay that stretched for quite a ways. 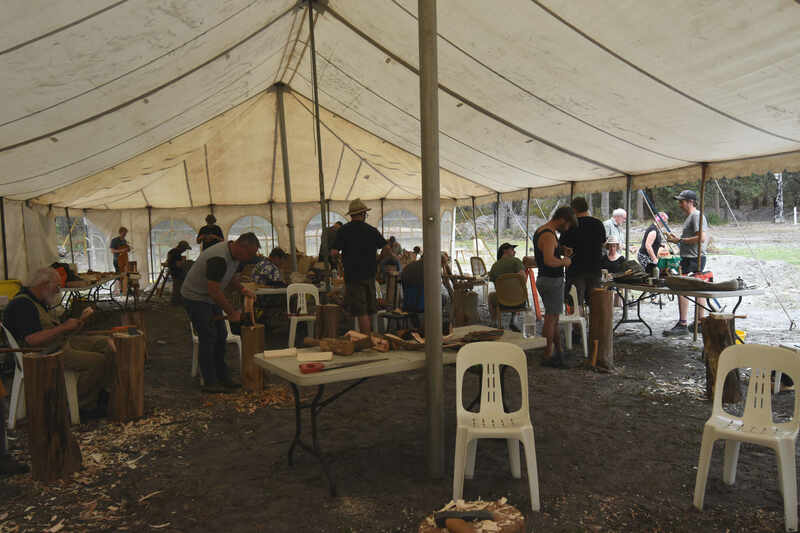 The couple of times I was there, other than the spoon carvers, 3 people meant it was crowded. We started out under a large marquee (think circus tent if you’re in America) – Alex at one end me at the other. I had a great group of willing students working their way through some unusual woods as far as I was concerned. I had to preface all my concepts with “Let’s see if this will work in ______.” Some of the woods we tried included Banksia, Casuarina (aka She-oak), Black Wattle, Native cherry (Exocarpos cupressiformis), and I forget what else. 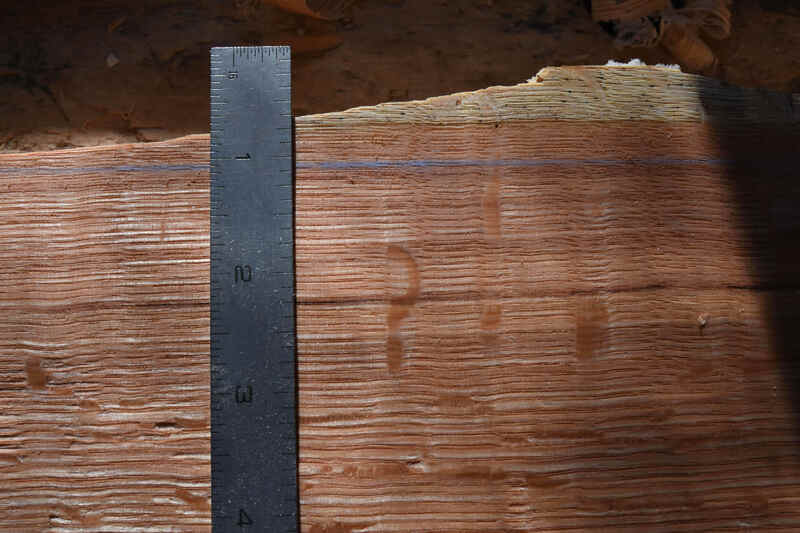 They flip around from local names, Latin names and other trees they call by names you’d recognize, but the trees are nothing like what they’re named for. Some of them worked. The black wattle showed promise to me – but then mine checked after a couple of days. I thought I had got it past the critical stage – but then the weather turned warmer and it cracked along the back of the bowl. Here in the more humid (most every place is more humid than southeastern Australia) it looks better. Alex gave a presentation to the whole group of how he carves his kuksas. 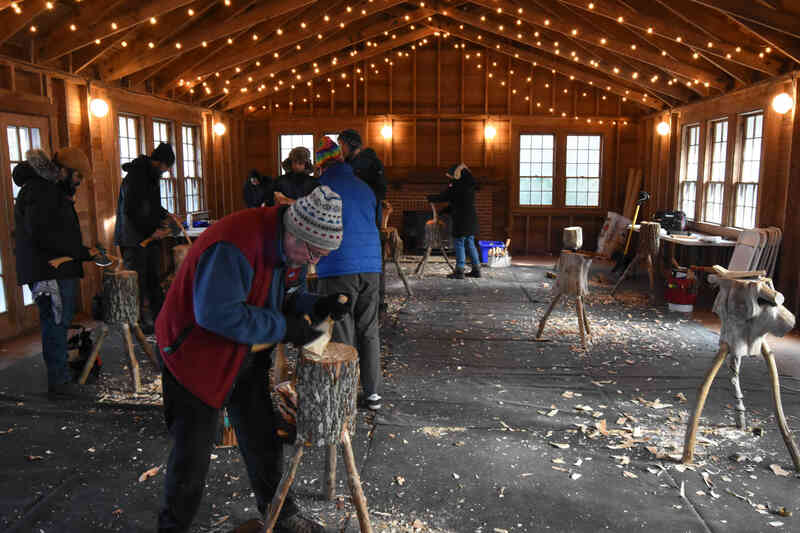 Later, he kept exclaiming “I was surprised how many people were carving them!” – we had to remind him that he showed everyone how to do it. One of my favorite stories of the event involved Alex. I arrived at Jeff & Jules’ place ahead of him by a few hours. I was hanging around, learning about parrots, cockatoos and more from them and their kids Misty (age 9) and Isaac (age 7). Isaac was asking me if I knew Alex. Isaac Donne: Do you know Alex? PF: Well, he has glasses, long hair and a beard, he’s much younger than me. He might be wearing a vest, and he will definitely be wearing a hat. He travels all over and loves to carve. PF: Oh, I don’t know. He’s a musician. Oh, and he’s from New York. ID: Oh – is he fancy? I didn’t answer that one. Told him he’d have to get to know Alex, then decide for himself if he’s fancy. A few things floating around. The first photo is not mine, nor my work. 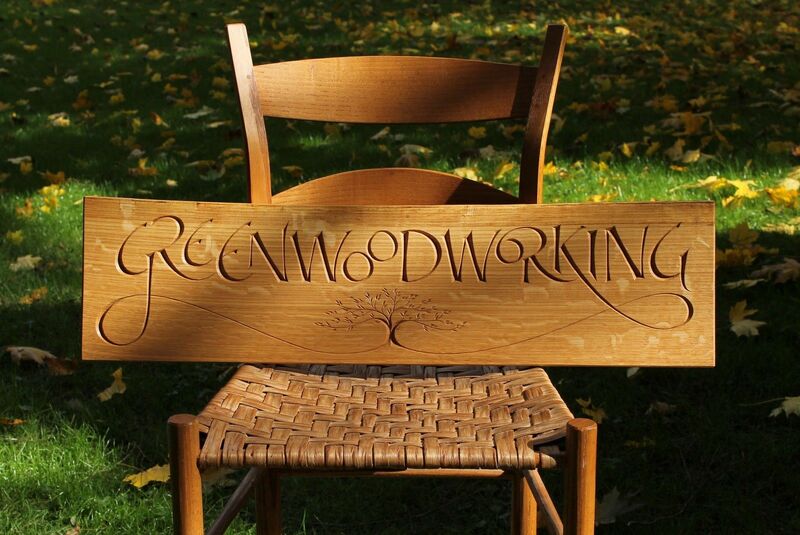 It’s Dave Fisher’s carved sign, made for Jennie Alexander. Finished just before JA’s death, so now what to do with it? I told Dave to keep it – but he had other ideas. Read on. 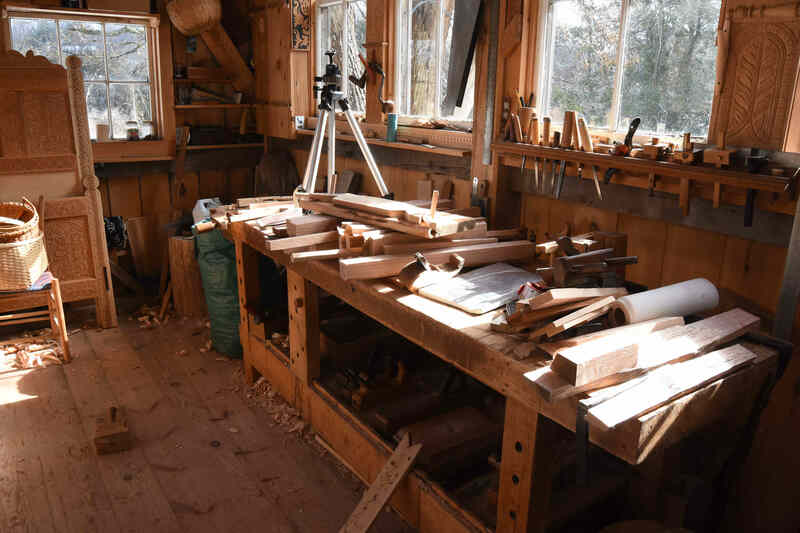 This scholarship has already received some generous contributions, and they will allow many people over the coming years to participate in Plymouth CRAFT classes and events who would have otherwise been unable to. I think that Jennie would have supported such an idea, especially considering the special relationship between her and Peter Follansbee, one of Plymouth CRAFT’s founders and most active instructors. I’ll ship the sign to the winner of the auction, then I’ll donate all of the proceeds to The Plymouth CRAFT Scholarship Fund. I will ship outside of the U.S., but will have to add accordingly to the shipping price listed. 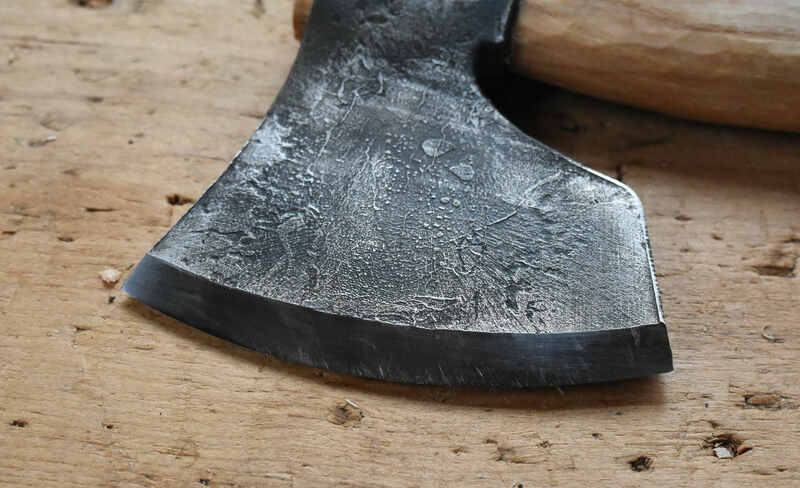 Last for today, I have a new hatchet to try out. It came already sharp, so that’s a plus. 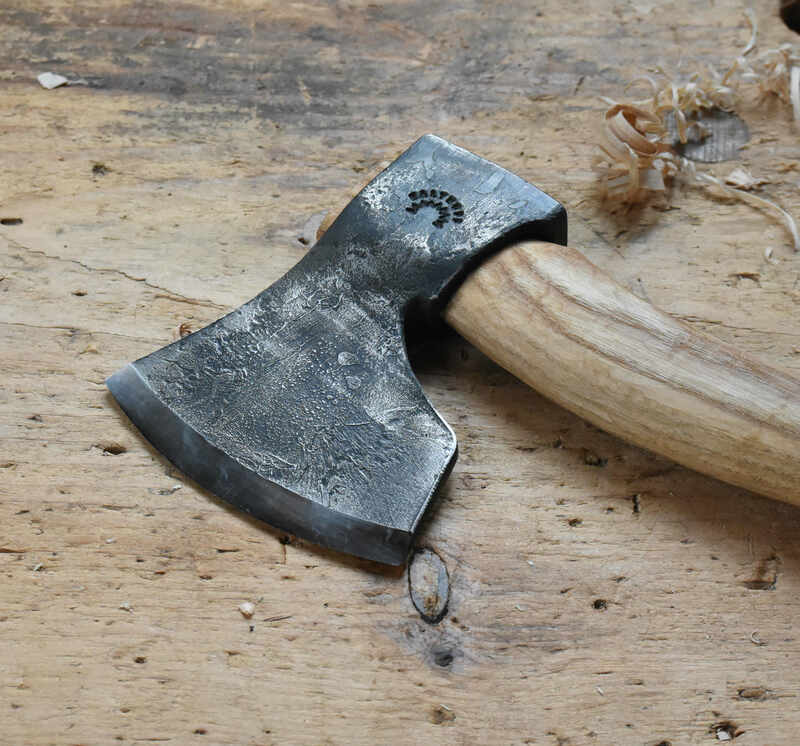 It feels like a cross between the Hans Karlsson hatchet and Svante Djarv’s “small Viking” hatchet. Thicker than Karlsson’s at the edge, giving it slightly wider bevels. This is similar to Djarv’s in that respect. Curved cutting edge. The specs are on Julia’s site – if I remember right, Beth Moen helped Julia work out the shape and size. 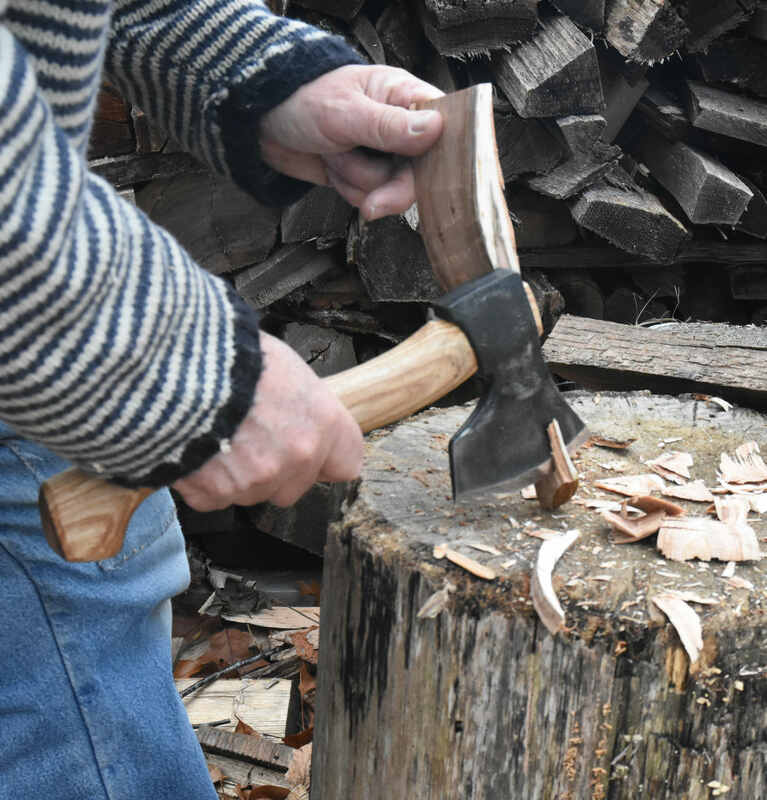 All you carvers out there can now add another great axe to your axe-lust-list.